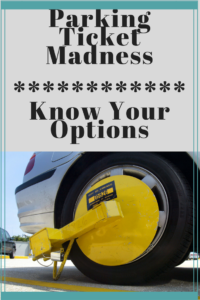 You are here: Home / Chapter 7 Bankruptcy / Will Chapter 7 Bankruptcy Help With Parking Tickets? Will Chapter 7 Bankruptcy Help With Parking Tickets? I recently received an interesting call from young lady who was seeking bankruptcy protection to help with outstanding parking tickets. She had no income whatsoever, so she was not a candidate for chapter 13 bankruptcy which is the repayment plan over a 3 to 5 year period. However, she was interested in simply holding off the City of Chicago for at least three months while eliminating other types of debt. Her plan, while not conventional, is actually a good one in her case. By filing chapter 7, she will be able to eliminate plenty of debt while holding the City of Chicago at bay. She can then work out an installment payment plan with the city after her chapter 7 case is over. This assumes that she will have some sort of income at that point in time. The more traditional route with parking tickets is to file a chapter 13 bankruptcy. Chapter 13 will allow a person to repay either all or a portion of the debt owed to the City of Chicago over a period of 3 to 5 years. While the person is in the chapter 13 payment plan, there is no risk of seizure of the vehicle or a boot on the vehicle. There is also no risk of a driver’s license suspension while the chapter 13 is active. This of course assumes that the debtor is not going to incur any additional parking ticket debt during that 3 to 5 year period. If the person does incur new debt owed after filing, then the person must stay current and pay that debt otherwise impoundment, the boot, and driver’s license suspension issues could arise. If you or someone you know is struggling with debt owed to the City of Chicago due to parking tickets, you do have two options in dealing with the matter from a bankruptcy standpoint. The chapter 7 filing will buy approximately 3 to 4 months of relief. The chapter 13 bankruptcy plan will provide 3 to 5 years of relief and allow for a small repayment percentage in many cases. The amount that the person pays back is based on the income, expenses, assets and liabilities of the individual. For most people who are struggling with parking tickets, they pay back anywhere from 10% to 25% of the debt over the course of 36 to 60 months. During this time, the vehicle is not at risk of a boot and the person’s driver’s license is not at risk for suspension. To see if you qualify for bankruptcy relief under either Chapter 7 or Chapter 13, you may contact my office directly at 847-520-8100. You will speak with an experienced, bankruptcy attorney who will provide straight talk and honest advice. If you don’t qualify for chapter 13, we will let you know up front. If chapter 7 makes sense, we will let you know that as well. Since 1991 we have been helping individuals and families in Chicago and its suburbs get out of debt under the various chapters of the bankruptcy code. If you are struggling, take the first step. Reach out and make that call. The relief is incredible.